23-04-2019: Book an Appointment to view Riverfront Residences Show Flat and get Direct Developer Price + Discounts. 01-02-2019: BRAND NEW 3 BEDROOM SHOWFLAT! Book your appointment now. 08-01-2019: Unbelievable! 1 Bedroom available from $598,000. Unbelievable! View our StarBuys. 04-01-2019: Analysts says they see some positive signs in 2019 private home prices. 03-01-2019: Information on Riverfront Residences Singapore Price and Showflat updated. Riverfront Residences is developed by Rio Casa Venture Pte Ltd, one of the best joint venture in Singapore real estate industry. The new launch condo in Hougang Avenue 7 is a brainchild of their joint vision of creating impactful changes to the real estate landscape through thoughtful development. From project conception through construction to completion, the group strives to deliver affordable quality homes that cater to the desires of the urban young professionals who aspire a sophisticated and vibrant lifestyle. Oxley-Lian Beng’s Rio Casa Ventures’ noteworthy projects include Devonshire Residences in River Valley, KAP Residences in Bukit Timah and Lincoln Suites in Novena. 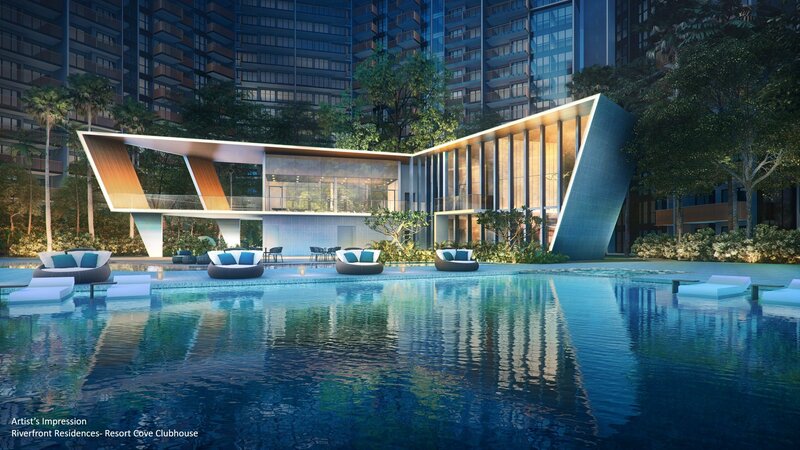 Riverfront Residences in Singapore is the latest new launch offering of a sought after condominium that meets the lifestyle needs and aspirations of their buyers. 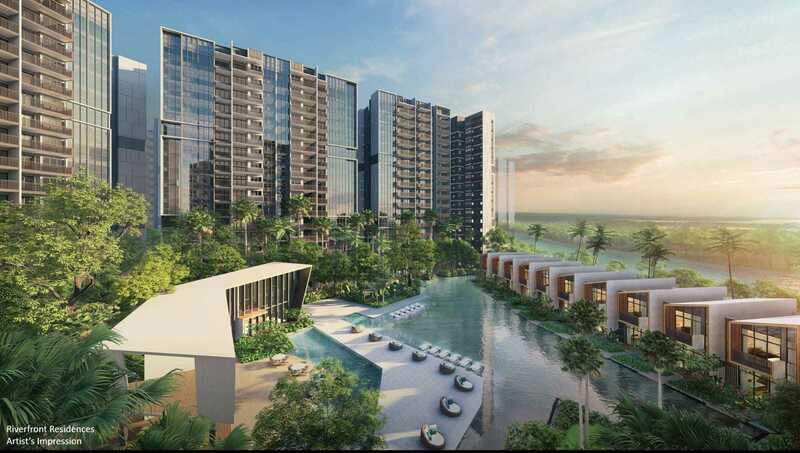 Riverfront Residences is a new launch condo in a Hougang private residential enclave consisting of Kingsford Waterbay, Heron Bay, Riversails, Rio Vista and others. Located at Hougang Avenue 7, Riverfront Residences is a short distance to Hougang MRT Station. Fronting Sungei Serangoon River, Riverfront Residences is a true waterfront living condo. Our Hougang condo is well served by a plethora of F&B, sundry and education amenities of the mature estate. Access to and front Riverfront Residences is convenient. Using the nearby KPE, drivers can connect to every location in Singapore via TPE, SLE, PIE, CTE and MCE. Learn more from Riverfront Residences Singapore location map about nearby amenities to know why Riverfront Residences is a perfect condo choice for upgrading families with children, lifestyle minded singles and couples. The initial launch of Riverfront Residences has concluded with more than 55% of total units sold! After the official launch, sales are steady, with a consistent number of units sold in each week. Our affordable price offering is a large attribute to brisk sales. Another selling point for Riverfront Residences is it’s rare and true waterfront living location. Potential home buyers hoping to understand more should book an appointment with us to visit the showflat. Our dedicated developer sales team is ready to provide in-depth insights about the project’s future potential and conduct an exclusive tour of the show units, to help inform your choice in selecting your desired home. You can also call us at +65 61007757 to get more information. Online registrants who booked an appointment here can get the Direct Developer Price from our developer sales team. Please note that Riverfront Residences units are on first come first serve basis. Riverfront Residences is a new leasehold 99 years project proudly presented by Rio Casa Venture Pte Ltd. Situated along Hougang Ave 7, the future residents of Riverfront Residences will find it easily accessible via several major expressways such as KPE. 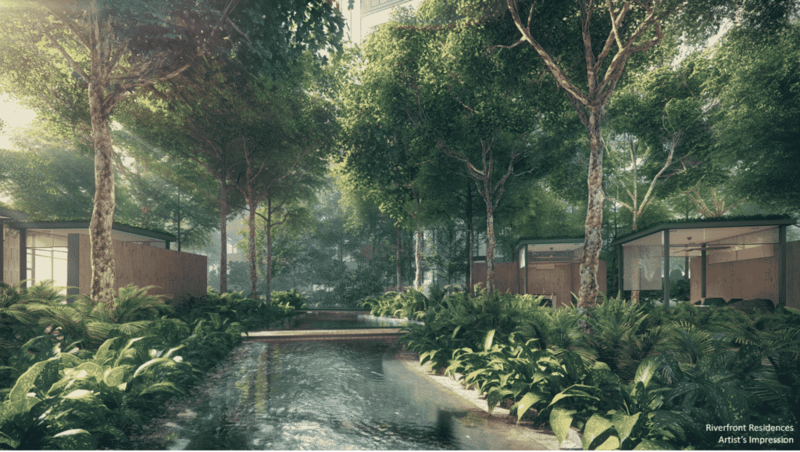 Riverfront Residences Singapore has unit types ranging from 1 bedroom to 5 bedrooms, terrace houses and retail shops. Buyers will be able to find a home befitting their finances and aspiration. A full set of recreational and lifestyle facilities are provided to fulfil the Singaporean’s aspired private lifestyle living. Imagine sheltered car parks, enclosed lift lobbies, daily access to a well-maintained swimming pool and gym membership. A whole plethora of neighbourhood amenities can be reached within minutes driving distance. Find out more about Riverfront Residences and book your appointment with our developer sales team for an exclusive discount and viewing.